There are over 100 reasons why your Swiss or American wristwatch won't run. One or more of it's 200 parts may be broken, rusted, miscalibrated, unoriginal, previously improperly serviced, under lubricated or just plain tired. Between 1910 and 1970, 150 million wrist watches for men and women were produced from nearly 1000 different movement models. If your Swiss or American watch falls between these years, and it wants to run again, you've found the right page. Watch restoration is fascinating yet not an easy profession. Diagnosing accurately, the mechanical problems of your watch over the internet isn't any easier. Most watch problems are diagnosed while being fully disassembled for servicing. 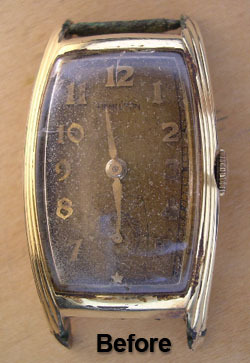 Most of the vintage watches I restore are already 70 years old, and are in need of parts do to wear, fatigue, or breakage. Each watch depending on age, model, style, original quality, usage, previous repairs, parts availability, and overall care, demands very individual care. Each watch that I authorize to be sent to me for restoration will be fully and painstakingly serviced using authentic replacement parts if necessary. All work and parts are guaranteed for one year. Once your watch has been properly serviced and repaired - and then treated with the care any fine instrument needs and deserves, it's not uncommon for them to give accurate and dependable service for a dozen years between servicing, often more. Most mechanical watch restorations are conducted in 3 blocks of time ranging from an hour to two each. Upon completion, every mechanical and artistic consideration has been a applied. 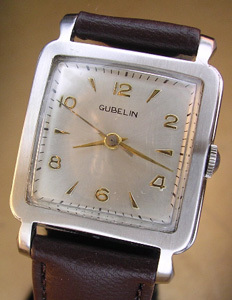 Your restored watch is ready again for daily use, and in most cases won't need it's next servicing for up to 15 years. The following pricing is a guideline of what your watch may need to again become a beautiful and dependable daily companion. The current condition of your watch will determine all. 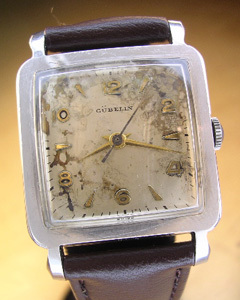 If your watch isn't in poor condition as most 70 year old watches are, expect to pay less. Every watch is fully disassembled for servicing. Every case is cleaned and polished to look its very best. Every crystal, too. Prices don't include return shipping. Shipping, special packaging and insurance cost is normally $30 ($2000 insurance). Below restoration prices include full servicing of movement, case and crystal to its most functional and presentable condition. All replacement parts and labor guaranteed for one year. Every mechanical and artistic aspect of your watch will be addressed. 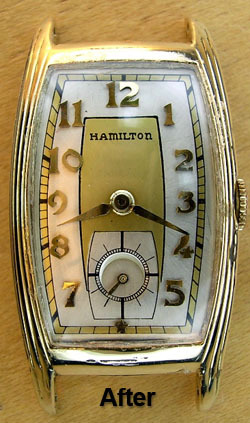 Please know that your family heirloom watch will be in very safe and competent hands. It's my goal to become your trusted watchmaker for many years to come. Period / style correct leather straps, installed: $20 and up. I look forward to your email inquiry detailing as much as you know about the current condition of your watch. Does it set? Does it tick? Any known previous servicing history too would be helpful in determining it's needs and providing you with a close estimation of the costs associated to it's successful servicing and repair. When I've authorized the shipment of your watch, I'll personally sign for it upon it's safe arrival and contact you without delay informing you of such. In less than 24 hours later I'll contact with with what I've learned about your watches needs and my impressions of the project. Then with your authorization, I'll proceed with it's servicing and repairs. In three weeks or less, your mechanical timepiece will have been successfully serviced and performance tested. You'll receive a photo of the completed project and accounting for it's servicing. Most mechanical watches lose their dependability or will stop operating because the inner workings have become dirty and it's lubrication has dried up. A full disassembly, thorough cleaning, reassembly and calibration will most often bring a watch back to life. Other times a watch will stop due to internal breakage, fatigue, or complications due to water damage-rust. This is when parts replacement is a necessity. I have a very deep archive of early American and Swiss watch parts, however due to the rarity of some watches and limited manufacturing runs of replacement material, not all watch parts are available for all watches. All rights RESERVED. All material on this Website, including text, photographs, graphics, code and or software, are protected by international copyright and trademark laws. Unauthorized use is not permitted. You may not copy, modify, republish, reproduce, post, distribute or transmit material on this Web Site, in any manner.